Heylos to all lovely ladies, am sure the Dusshera holidays must be keeping you busy with kids turning and the house upside-down. Recently I suggested you on how to be selfi-ready with your little one in ethnic Navratri2015 attire and which are best places to visit in Mumbai to experience the fervour of nine nights. This season of festivity brings lot of colour, fun and bonding with family and friends. 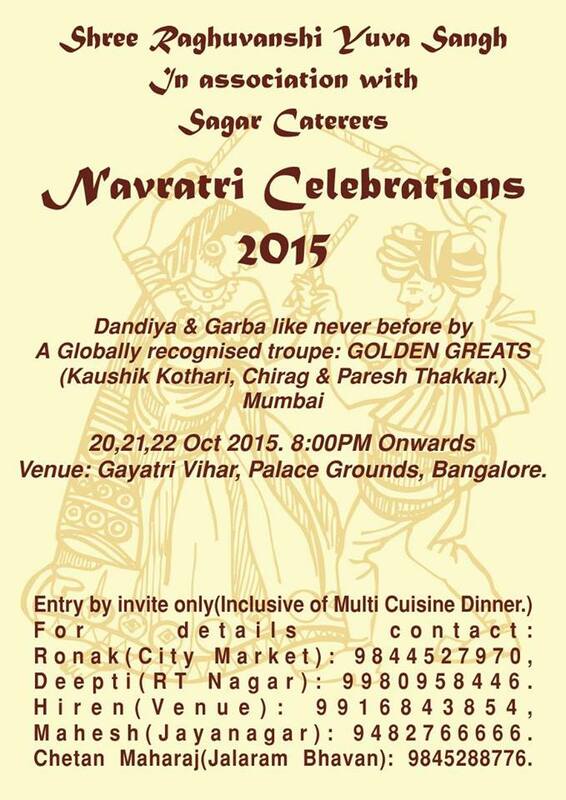 Celebrating a Navratri or Diwali in Bangalore is not so alien in Bangalore anymore. We recently hosted Dandiya Night at Art Blen cafe and also looking forward for this festive weekend. Being a Bangalore mother who is addicted to blogging and media enthussaist, I always make sure that the events I host or sugest my mommy readers to visit are kids friendly and has activities for all kids and adults. So What are you mommies planning for this festive long weekend? 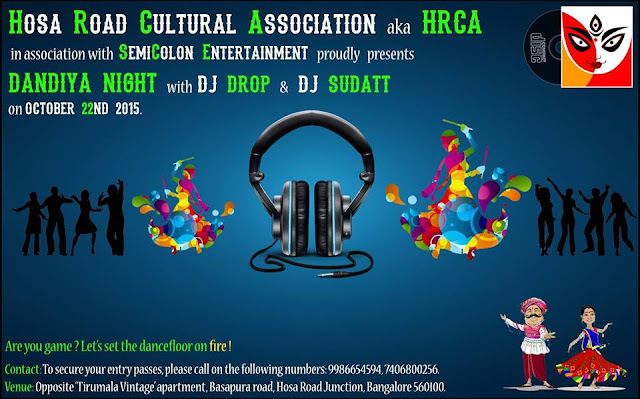 we have amazing events in Bangalore. Here is my handpicked Top #AMustGoEvent for moms and kids out there. #BangaloreEventsForKids ;-) approved by #MotherBlogger #Bangaloremoms. 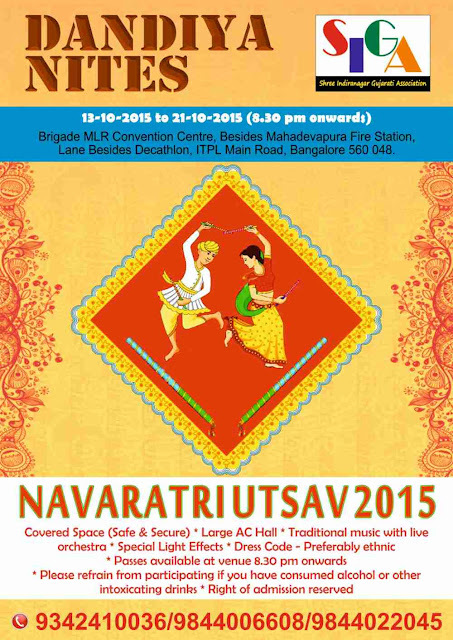 Navratri 2015 Shree Raghuvanshi Yuva Sangh, Bangalore and Pankaj Kothari brings you Navratri Utsav 2015. 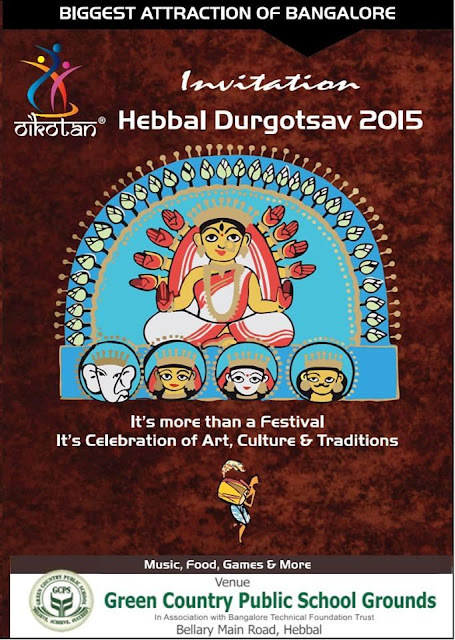 Three nights of tradition, devotion and colourful renditions. Dandiya and Garba like never before by Kaushik Kothari and Golden Greats and your favourite drummers Chirag and Paresh Thakker. Submerge in dance and togetherness !!! A DJ line-up to make the evening an awesome experience. Seal the memories of Durga Puja 2015 forever. 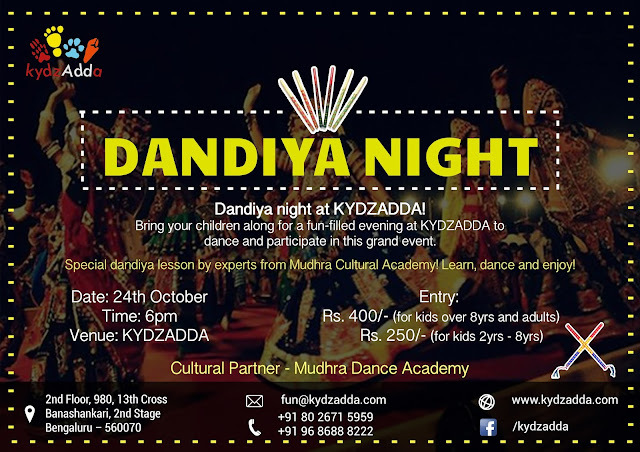 Dandiya Night for one and all at KYDZADDA! This time we are extending the dance to adults along with the kids. Everyone is welcome to enjoy the fun and dance this Saturday on 24th Oct from 6pm onwards at KYDZADDA. Not very good with the steps? Not a problem. Come along and learn dandiya from the experts from Mudhra Cultural Academy. 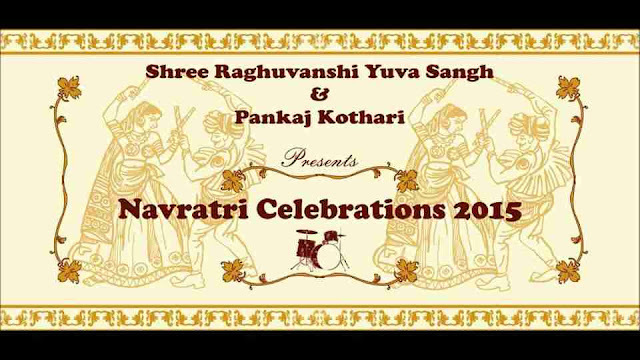 Check out some awesome performances and enjoy and sway to the tunes of Gujarat! Best dressed, Best dance and lots to look forward to! There will be stalls, food and lots of music. Tickets can be purchased at KYDZADDA or can also be booked online using the link below. For more details, call on 9686888222. 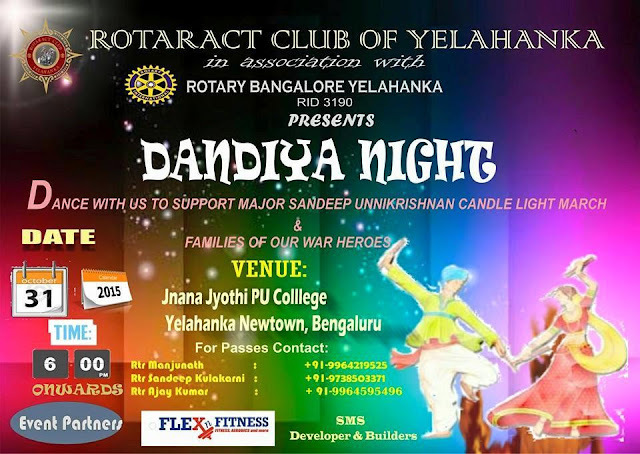 Rotaract Bangalore Yelahanka RID 3190 Presents Dandiya Night. Dance with us to support Major Sandeep Unnikrishnan Candle Light March & Families of our War Heroes. Note: Donor passes are available at venue only. 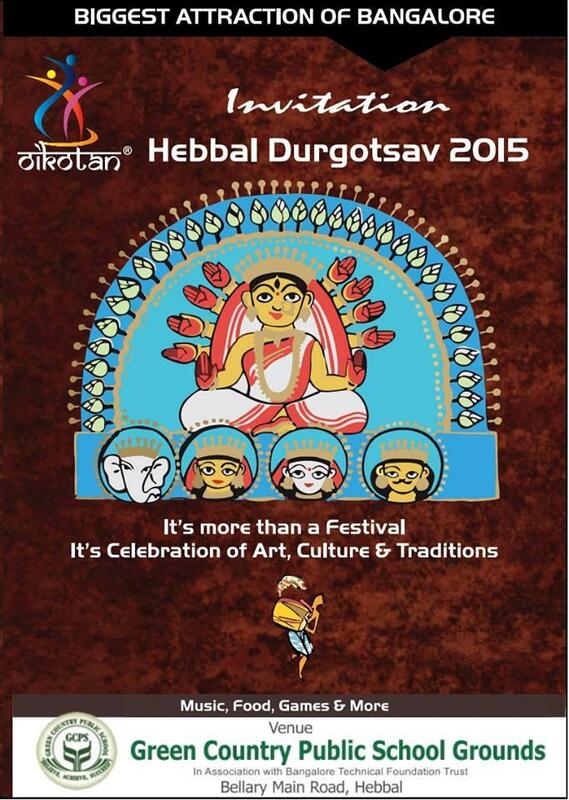 Hebbal Durgotsav (also known as Durga Puja) 2015 it's the festival of art, culture and traditions.